Rogue Angel, winner of the Irish Grand National in 2016, is set to carry top weight in Sunday's renewal of the Ulster Grand National, sponsored by Toals Bookmakers, at Downpatrick. Trainer Gordon Elliott has a trio engaged in the Toalbets.com Ulster Grand National and while Rogue Angel is seeking a third National victory, having also won the Kerry National in 2016, the Meath trainer also has Space Cadet and Out Sam entered. Irish champion trainer Willie Mullins, who claimed his first Cheltenham Gold Cup last week, has Undressed engaged while Navan trainer Noel Meade is doubly represented with Stoneford in the same colours as Rogue Angel and Killer Miller, owned by JP Mc Manus - the leading Irish owner also having Teachers Pet entered. Trainer Henry De Bromhead, who enjoyed dual success at Cheltenham, has Surf Instructor in the feature of Downpatrick's racing year. Included in the 17 declared entries is Mill Forge, trained by Stuart Crawford, with the Larne handler having won the race in 2014 with Hidden Horizons while Armagh trainer Keith Watson is due to be represented by Amaulino, a surprise winner at Leopardstown earlier this month. School Lane, trained at Newry by Liam Lennon, is another local intended runner. The Rated hurdle is endorsed by the Templepatrick Sloan family under their WKD banner in addition to their support of the Best Dressed Competition and Count Simon, owned by Pat Sloan, which bypassed Cheltenham in favour of Naas, finishing runner up, is engaged in the supporting feature. The race has attracted a high class field,including Joseph O'Brien trained West Coast Time, Western Boy, Elwood, Kulper Belt and Andratx - the latter trained by Mark McNiff who is a regular in the winners enclosure at the local track. √Alan King looks to have found a good opportunity for Ballywood to bag a good prize by way of the Bromfield Sand & Gravel Handicap Chase at Ludlow. The five-year-old has not had that much racing since joining King from France, but has done little wrong. Hes No Trouble has a leading chance in the Windsor Clive International Novices' Hurdle, also at Ludlow. CHEPSTOW: 2.20 Dragon Khan, 2.50 Episode, 3.25 Deise Aba, 4.00 Angels Antics, 4.35 Treasure Dillon, 5.05 Just Gone Midnight, 5.40 Double Ross. CORK: 2.10 Ocean Voyage, 2.45 Landofhopeandglory, 3.15 School Boy Hours, 3.50 Germany John, 4.25 Still Alive, 5.00 Forever Gold, 5.30 Eileen O.
LUDLOW: 2.30 Falco Blitz, 3.00 Gortroe Joe, 3.35 Hes No Trouble, 4.10 BALLYWOOD (NAP), 4.45 Landsman, 5.15 Ballotin, 5.50 Weapons Out. SEDGEFIELD: 2.05 Calliope, 2.40 Robbing The Prey, 3.10 Tetraites Style, 3.45 I'm To Blame, 4.20 Enfin Phil, 4.55 Top Man Tim, 5.25 Late Date. By Ashley Iveson James Tate has his string in flying form at present and can add to his tally at Windsor with the promising Fields Of Athenry. 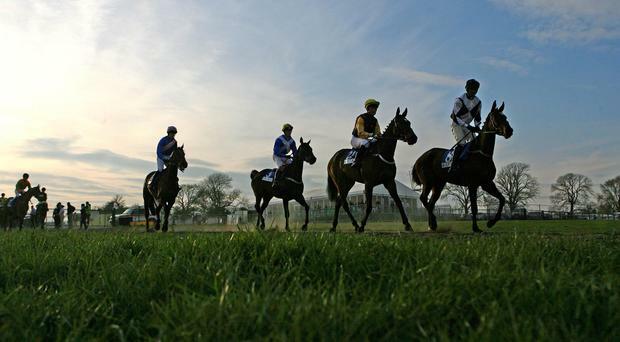 By Ashley Iveson It is Coral Scottish Grand National day at Ayr, and Big River is fancied to claim a popular home victory in the feature event. By Anita Chambers Blonde Warrior can get his 2019 campaign off to a perfect start in the Dubai Duty Free Full Of Surprises Handicap at Newbury.